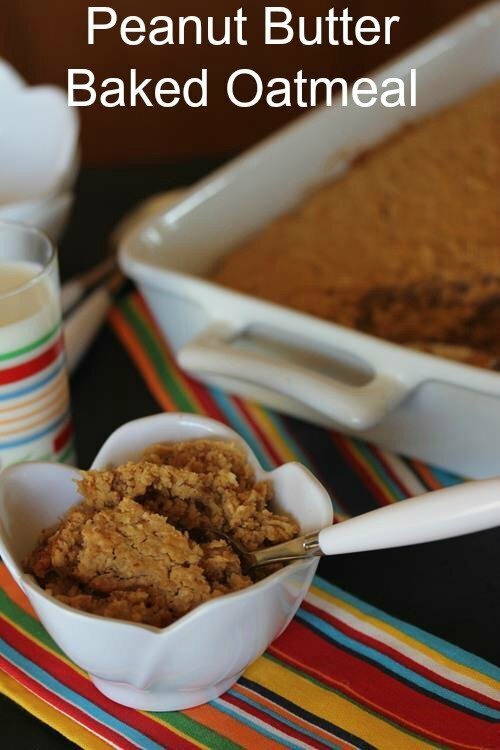 Peanut Butter Baked Oatmeal is a quick and easy breakfast that your your family is sure to love! Even non oatmeal lovers enjoy this recipe. 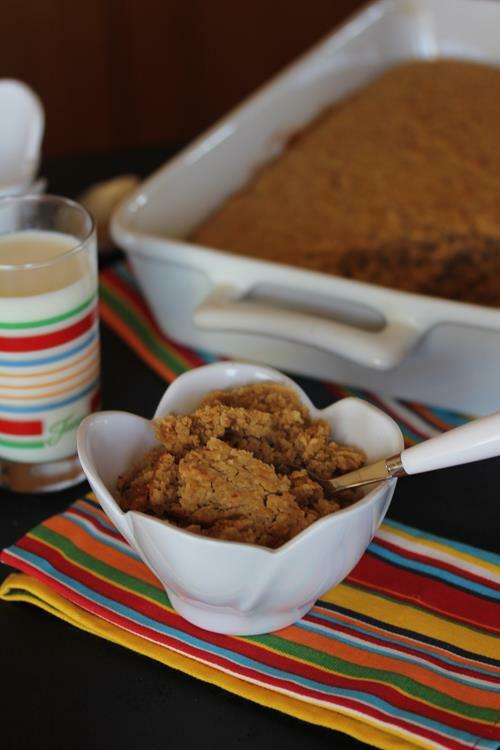 It is the perfect way to get your kids to enjoy a bowl of oatmeal for breakfast! I am always looking for easy, but healthy things to serve for breakfast. All to often I serve cold cereal or yogurt and toast. I am trying to get better, really I am, but I struggle with breakfast ideas. So, I am really trying to come up with things that work for us. One of the things that my family does like for breakfast, and I like to make, is baked oatmeal. I have a basic recipe that I make and we serve it with fruit and milk. But I have been wanting something different. So I tried a few things and I came up with a peanut butter version of baked oatmeal. My family loves this. My son who does not like oatmeal or baked oatmeal, even thinks this is good. My husband, the peanut butter lover of the family, thought this was really good. I like the flavor of the peanut butter in this, but I also like the fact that it makes it a little more filling. 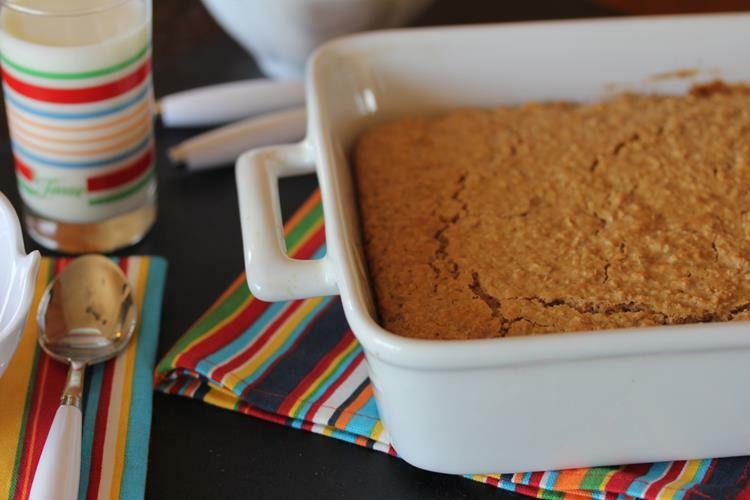 I used brown sugar in this and I think it works much better than white sugar. It really gives it some extra flavor. Our favorite way to eat this is with a little milk poured on top of it. A simple and delicious breakfast treat! 2. In a bowl mix together all ingredients until well combined. 3. Grease a 9×13 pan and spread mixture into pan. 4. Bake for 20-25 minutes. If you like it a little more firm and crunch cook for a few minutes longer. 5. Serve with warm milk over top. Ok, so when I first saw this recipe months ago I didn’t look carefully and I thought it was just a way of making a bowl of oatmeal in bulk in the oven. Later I realized differently and have been wanting to try it, but I always hesitate to dive in to a new recipe since going gluten and dairy free at our house. So worried I’m going to waste expensive ingredients. Again, I should have looked closer. I just took my first batch out of the oven and I’ve already eating 2 squares of it myself. Everyone loves it and I can’t wait to try other variations. Very quick and easy to whip up!!!! And no expensive flour or leavening. I substituted plain soy milk and coconut oil for the butter and it’s perfect. Thank you for sharing this one! I am so glad you liked it. 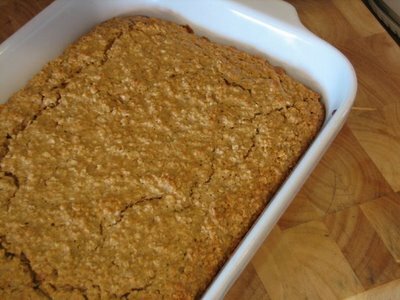 Since we have been dairy free this month I have tried several of my baked oatmeals with rice milk or coconut milk and it worked great. So yes the baked oatmeals are easy to do gluten and dairy free. Thanks for letting me know how much you enjoyed it! Does anyone know if I could make this and eat it throughout the week? Trying to do breakfast meal prep and would love to try this!! Yes, all my baked oatmeal recipes work great made ahead and reheated. I even sometimes freeze them and my kids take them out and reheat them that way. I hope you enjoy it. Made this today for the fam – very good! Mine turned out a bit crumbly, but the flavor is very good. Maybe it’s because we don’t normally pour milk on top, so that made it different. I like to put a dab of maple syrup on top – but I like your chocolate chip idea! I am glad that you enjoyed it! 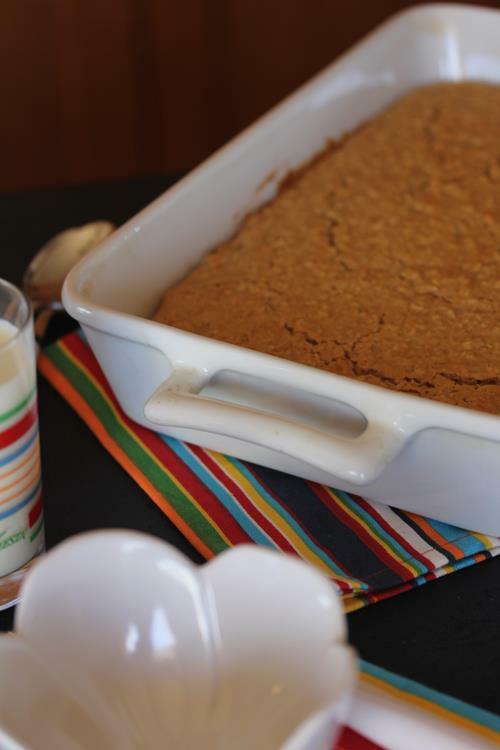 I have a lot of readers that have said they add more or less liquid to get the texture they want, so you could easily add a little more milk for a less crumbly texture. And yes chocolate chips are great added to it, although once you do that with kids, going back to the none chocolate kind is hard for them. 🙂 . I also like to add spoonfuls of jelly on top and then bake it too. Then you have a peanut butter and jelly baked oatmeal! Do you have the calories and nutritional info for this recipe? MyFitnessPal.com has a tool where you can put in the URL of the recipe and it will calculate the nutrition of the ingredients. I use it a lot because my son is diabetic. I am on an alternative diet for health reasons, so I can’t have oats/grains, could I substitute seeds like chia, sesame, Sunflower, etc? I am not sure it would work quite the same with seeds because the oats cook in this. I don’t know if the seeds would hold together like the oats do. I am so glad that you made it and enjoyed it! And good for you cooking at a young age! I love to hear that kids are cooking and enjoying it. If you loved this one you would probably enjoy some of my other baked oatmeal recipes. They are all really easy to make. Thanks for letting me know you enjoyed it! This recipe works great baked in muffin tins. They are pre-portioned, and the liners make cleanup a snap! Yes, I love cooking my baked oatmeal recipes in muffin tins. It is great portion control and they freeze great that way. I am glad that you enjoy them. I only have rolled oats. Should I precook them in that cup of milk and let it cool before mixing the other ingredients? I think you mean rolled oats like the old fashioned oats instead of quick oats. If so yes you can use those instead. The texture will be slightly different, but they work fine and you don’t need to change anything else. I hope you enjoy it! Do you have the nutritional breakdown? Calories, fiber etc? It is in the oven and smells really good. I added a small amount of chocolate chips. Yummo!!! This is delicious. Tried it with the milk poured over it….YUM!!!! This is delicious. Tried it with the milk poured over it….YUM!!!! I bet adding chopped apples would also be good. Do you think substituting peanut butter with almond butter and adding slivered almonds would also work? I am going to try.